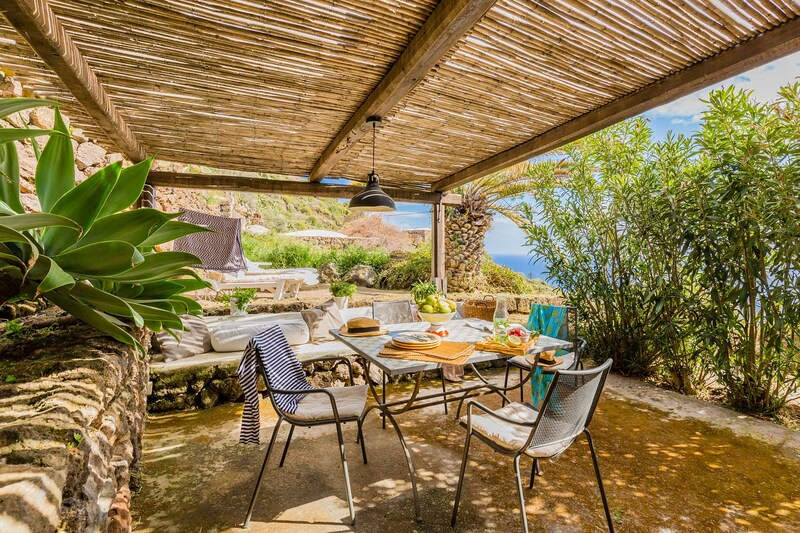 Among the green of a lush garden, the scent of aromatic plants and the bright colors of bougainvillea, it is set the small but charming dammuso Oleandro, located inside a large property in Scauri district, in the western part of Pantelleria. It is ideal for a holiday for two; the dammuso consists of a functional kitchenette, a comfortable double room and a bathroom with a wonderful niche shower. Outside, a beautiful terrace covered by cane roof creates a perfect shade spot where to relax on the typical ducchena and to eat outside. A characteristic stone staircase leads to the domed roof, which can be used also as a solarium. The wonderful view of the harbor of Scauri and the sea, which allows you to enjoy beautiful sunsets, with an eye towards the African coasts is an added value of the dammuso. The dammuso Oleandro is located a short distance from the village of Scauri, where you can find shops and services and many typical trattorias. Moreover, from the port boats and rubber dinghies depart for trips to the most beautiful and famous coves of Pantelleria.